Over one night and five days from 12 -17 April, TMAG will be transformed by the creative energy of children with a great range of special events, displays, performances and activities to get involved with. This year’s festival theme, ‘EarthTime’ responds to TMAG’s current family exhibition Dinosaur rEvolution and will enable visitors to explore the way the Earth and the natural world evolved. The Children’s Festival is an important part of the museum’s annual programming, providing an opportunity for young people to actively participate in the museum’s activities and present what’s important to them. The Festival begins with a special Opening event, including a dinosaur-themed disco, a youth circus performance from the Circus Studio and an appearance by the much-loved Rosie, the life-sized Utah-Raptor. A special feature of this year’s festival is a collaboration between TMAG and the Tasmanian Symphony Orchestra (TSO) to present a narrated, interactive musical for young children. Family learning is at the heart of the museum’s visit experience and the range of activities have been created to offer inspiration to both children and adults alike. Director of TMAG Janet Carding said that a significant goal is to ensure the festival is for young people, by young people and this is achieved in part, through the TMAG Children’s Reference Panel. “TMAG works closely with members of its Children’s Reference Panel in developing the program of activities, with several members acting as hosts at tonight’s Opening event”, Ms Carding said. The success of the TMAG Children’s Festival over the past three years demonstrates the museum’s ability to create strong connections with key audiences such as children and families. “Through regular programming such as the Festival, we hope that younger visitors create lasting memories and develop a life-long love of museums as they grow up to become the parents of our future generation of visitors,” Ms Carding said. This is the fourth year that TMAG has run its very popular Children’s Festival, with the generous support of the City of Hobart. 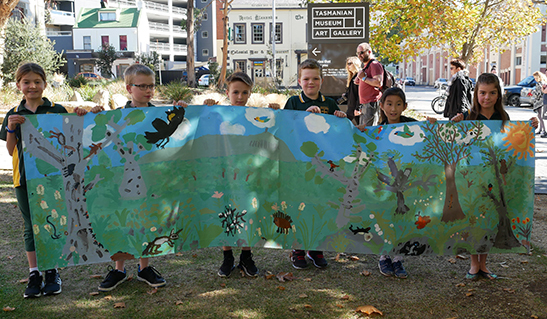 Entry to the 2019 TMAG Children’s Festival entry is free. An admission fee applies to the performance of Dinosaur Steps by the TSO. For bookings and further program details, visit www.tmag.tas.gov.au/childrensfestival. Image: Mount Nelson Primary School Students with their School Banner Artwork. This page was last modified on 12th April 2019.